Our doubles feature 2 full-sized beds in comfortable, nostalgic surroundings. Room 10 is unique, with a queen bed and full-sized bed. Each room has a desk to work or read at. Bathrooms feature unique tile work and original fixtures. 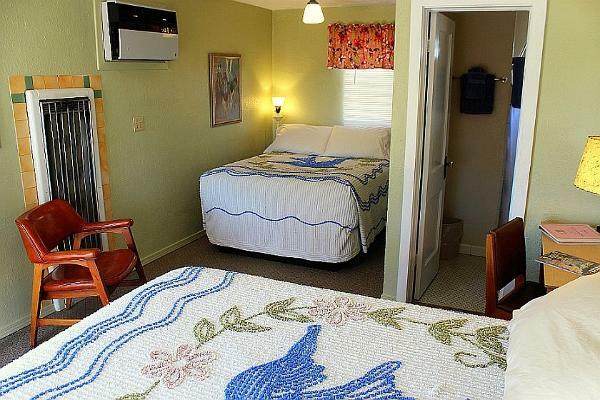 Vintage lamps and 1939-era rotary dial phones complete the nostalgic appearance of these rooms. All rooms are strictly non-smoking, and pets are not allowed. 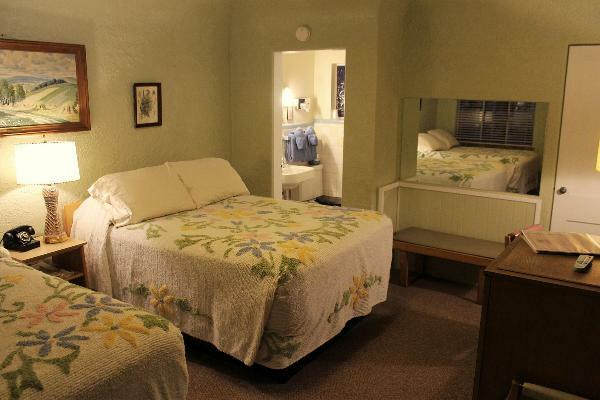 Room 10 features a non-traditional layout, with two comfortable beds for 2-4 people. 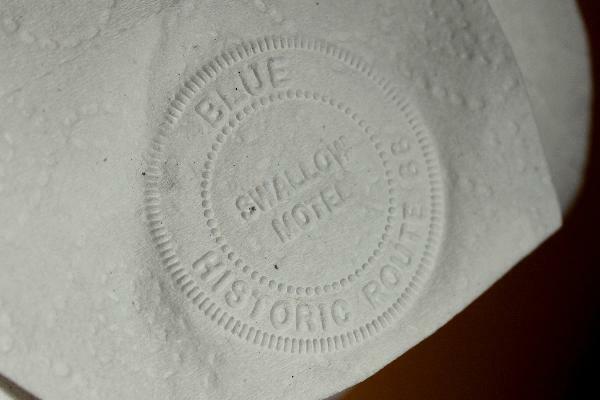 Every room receives the Blue Swallow seal of approval when it is ready for your visit. 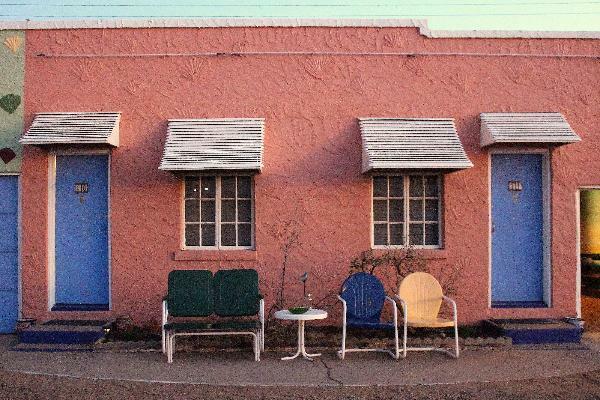 Outside every room is a patio with period-style metal furniture to enjoy the afternoon or evening in. Room 14, with two full sized beds, is a very pleasant place to spend a night. 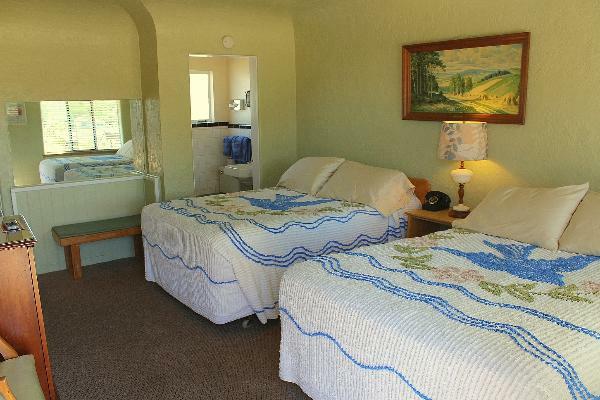 Room 15, another double, is furnished almost entirely with original furnishings dating to the early 1950's. 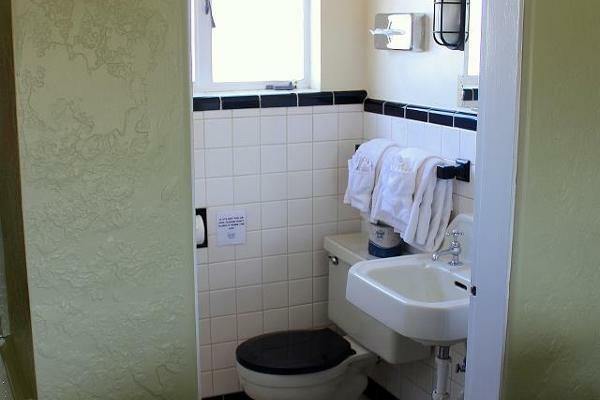 The bathrooms feature original tilework, fixtures, and step-in shower. per day Winter Rates to take effect January 1, 2017.
per day Rates for Blue Swallow rooms, beginning April 1, 2018.
per day Rates for the 2019 Winter period, January 1, 2019 to March 31, 2019.
per day Room rates for the Summer period, April 1, 2019 to October 31, 2019.
per day Rates for the 2019 Winter period, November 1 to December 31, 2019.